What began as an innocent mistake changed my life forever. Shortly after moving to the UK, I took in a homeless cat that kept appearing on my doorstep. Probably because I kept feeding her. Over time, I fell completely in love, only to discover nearly a year later that she was actually the neighbor's cat. Luckily, we all became good friends, the neighbor, the cat and me, and even though I no longer live in the UK, that cat hasn't left my heart. Since then, I've been wandering around the world with my partner Perry, visiting cat cafes, and trying to forget my beloved fur baby. Click here for the full story of The Neighbor's Cat. The Neighbor’s Cat is the alter ego of Paula LaBine, an itinerant cat lover who writes about cat cafes, rescue/adoption & TNR, and has been featured in Miau Magazine, Katzenworld Blog, The Catnip Times and Taiwan Scene. 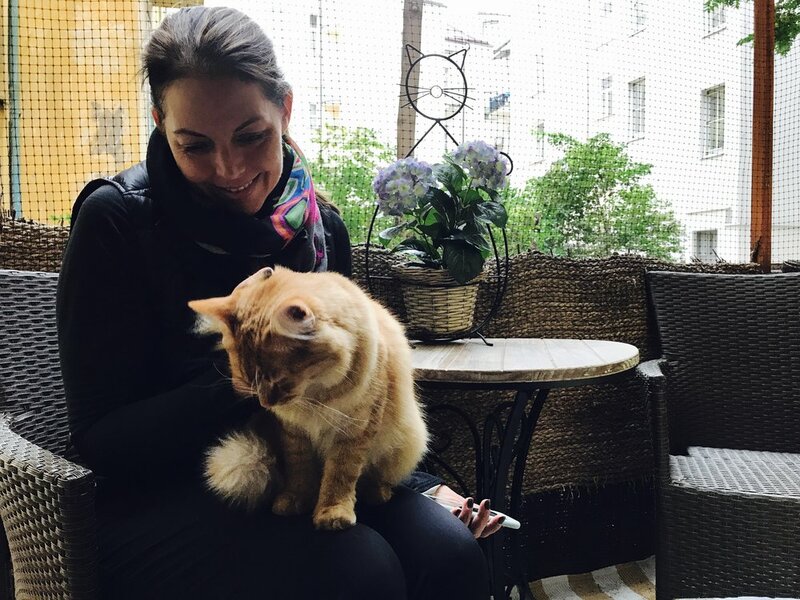 She is currently on a quest to visit every cat café in the world, 210 in 29 countries so far! Find her at theneighborscat.com or on Instagram/Facebook/Twitter @catcafeviews.